The “we want an objective review” cry that frequently pops up on the internet is one of the most annoying arguments on the face of planet earth, but that doesn’t mean that there aren’t any interesting wrinkles with the subjectivity of criticism. I’m acutely aware of my mood and my company when I’m evaluating a game for review. Am I tired? Did I lose badly? Did I find a successful strategy? Am I enjoying this game because of the jokes we happen to be sharing at the table, or is the game enabling that enjoyment? 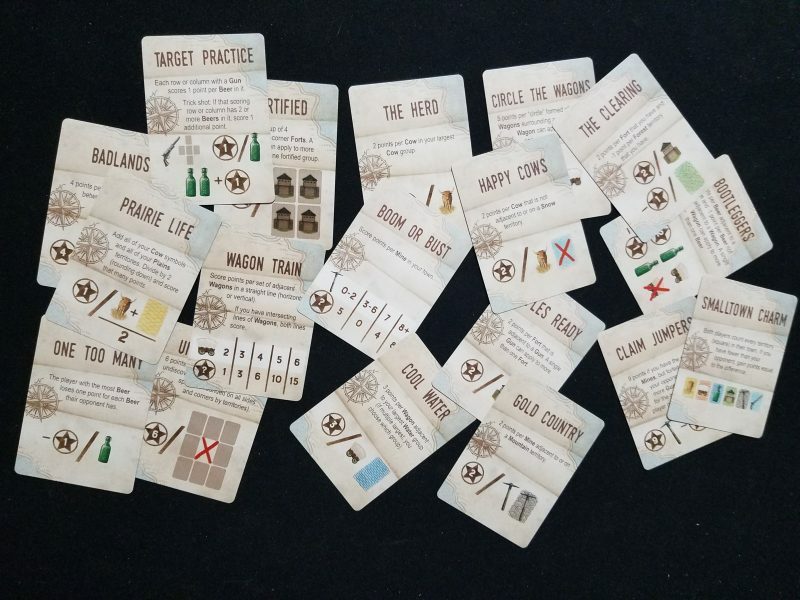 Circle the Wagons is an interesting case because I played, and loved, its ostensible sequel first. Sprawlopolis is still my favorite microgame by a fairly wide margin, and I was curious if that was going to set my expectations too high for its older cousin. On top of that, I wonder if this is even a reasonable concern to have. The kind of framing bias I’m worried about will probably be shared by more readers than not, as Sprawlopolis sold 4x more copies in its Kickstarter. Does it actually matter? I’m not reviewing Circle the Wagons in the context of 2017, but right now. Is it valuable to review something with an eye on the past? If I wanted to review, say, Acquire, should I give it a handicap because it was made in 1964? I don’t think that’s helpful at all, now that I think about it, but I think it’s a fairly common sentiment. Anyways, Circle the Wagons isn’t as good as Sprawlopolis, but it’s a fun little two-player romp with a drafting system that brings more strategic depth than you’d expect at first blush. Both games are centered around card-based “tile” laying with each card quadrisected. The placement rules are simple–you can put the card next to or on top of the cards you’ve already placed. Each round there will be three randomly selected point-granting criteria on top of the normal scoring of totaling the highest contiguous sections of each background type. That’s no different from Sprawlopolis, and it’s still a fantastically economical use of the limited number of cards available in a Button Shy wallet game design. 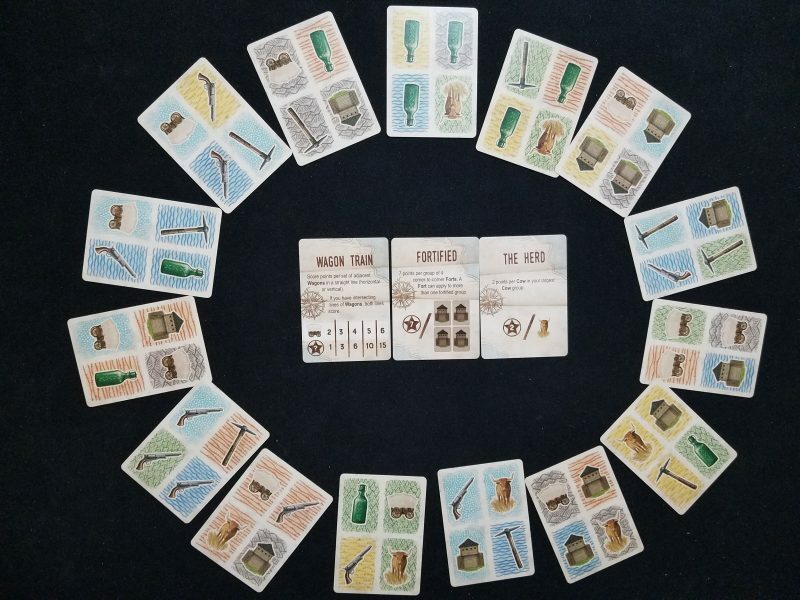 However, even though both games meet that 18 card maximum, those cards are ultimately split in half in a Circle the Wagons tableau because each player has their own. You wouldn’t think it would be very important, but that difference makes me care far less about the beauty and success of my tableau. The art might be another reason I don’t care quite as much about playing Circle the Wagons well (as opposed to simply enjoying the experience of playing). While it’s certainly not bad, the color palette isn’t as vibrant as Sprawlopolis’ sunny city. That could be excused for thematic reasons, but the art doesn’t quite evoke a dusty 19th century wagon excursion either. From a strictly practical perspective, there are two blue background colors that are very easy to mistake for each other. Sprawlopolis is an easy comparison to make, but Circle the Wagons also reminds me of Patchwork, the ever-loved Uwe Rosenberg quilting game, with its circular two player draft and brinkmanship. Circle the Wagons feels even more cutthroat, and not just because the game is shorter and more dense. When it’s your turn to draft, you can choose any of the cards in the circle, but any cards you skip over are then immediately drafted by your opponent. This could have easily failed as a mechanism, creating non-decisions where people always choose to deny their opponent any extra cards. The point bonuses are so well-crafted, however, that this is not the case at all. Sometimes you want fewer cards in your tableau. Sometimes a card is simply so valuable in that particular game that jumping ahead to get it isn’t a matter of if, but when. Will you hold off one more turn and risk your opponent making the leap? If they do, will the cards you gain be worth it? This makes Circle the Wagons feel much more strategic than Sprawlopolis. When the game begins, you can see all of the cards right there in front of you, and you can immediately start to plan. Getting points for every wagon this game? Where are those wagon-heavy cards? Can I set the starting point in such a way that I can latch onto a great sequence of them? At what point will my opponent attempt to foil that plan, and will that devastate me? It’s not often that you see a game that front-loads its most interesting decisions and mind games in such an extreme manner. While I’d usually say that this is sub-par game design, in a wallet game it’s not overwhelming and I kind of like it. There’s a game that goes on before the first decision is even made–a sort of puzzly psychological fencing match of hypotheticals. I can’t quite get past the Sprawlopolis comparison, though. I could spend minutes analyzing those first couple of decisions, but I find myself wanting to casually breeze through the game instead. While I love tense 2-player experiences, I find my mind wandering over to how much more enjoyable constructing a city with my friends would be. Maybe that’s the key word–construct. I never feel like I’m building up to something very much in Circle the Wagons. Rather, I’m fighting and preventing. I’ve never looked at my completed tableau and felt like I had accomplished something nice. Instead I’ve felt like I’ve outsmarted someone in a grueling duel. 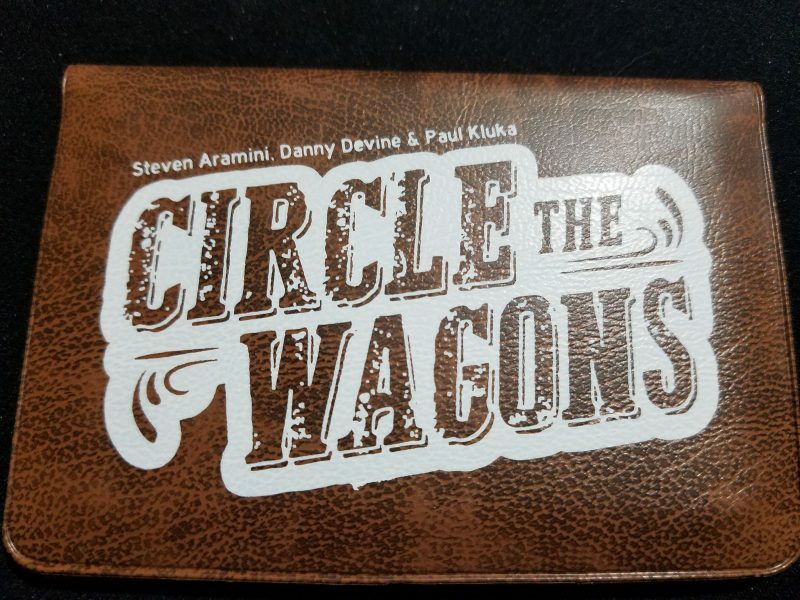 And while I enjoy grueling dueling as much as anyone (see reviews for: Twilight Struggle, Netrunner, Exceed, Riftwalker, etc), Circle the Wagons feels a hair too slight. I don’t feel like I’ve come out victorious in a long trek through the wilderness, but in a quick firefight on main street. Flash. Bam! Dust settles. Play again? Sure, why not.